A few weeks ago I noticed a heartbreaking demolition just north of Downtown. 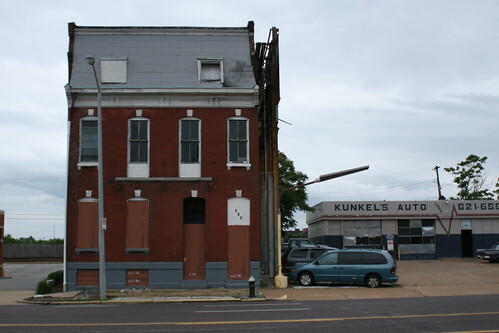 On one of the most active blocks in the vital transition between the heart of Downtown/Washington Avenue Loft District and neighborhoods to the north (part of Paul McKee’s Northside Regeneration), a rare reminder of contiguous urban form connecting these areas has been erased. Built in 1885, the home pictured below was purchased for $135,000.00 just over a year ago, only to be demolished a couple of months ago at a cost of $6,000.00. 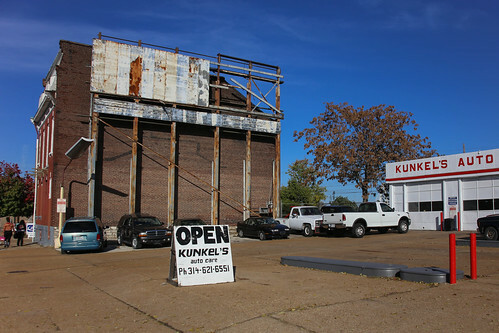 This last weekend I found the time to photograph the lot, and speak with the neighbors at Kunkel’s Auto. Apparently the little shop’s days are numbered as well. 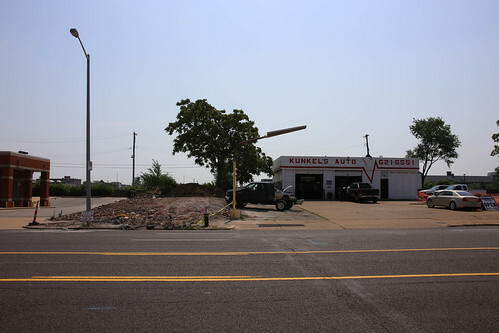 The rumor is that a gas station will be going into this prime lot near the new Stan Span/Downtown interchange, and is part of Northside Regeneration’s plans for the area. In the image above, the red circle identifies the demolished home, blue circles point out existing gas stations, and the green circle is the only other surviving home on this important stretch. Note that much of the Tucker frontage is devoted to surface parking and inappropriate infill like the straight-out-of-suburbia McDonald’s at 1119 N. Tucker. 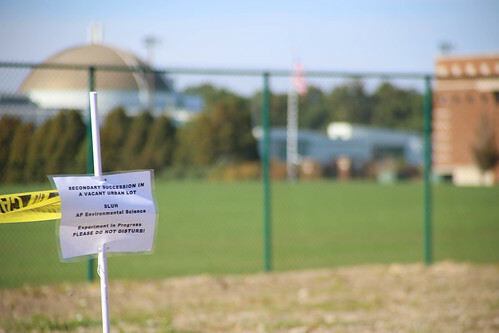 Single use modern housing developments barricaded from walkable downtown by superblocks and fences dominate areas to the east and west, leaving Tucker as the only feasible way that McKee’s plan can connect livable urban places to the north and south. By squandering what little is left of this area’s built environment for another gas station/convenience store, Northside Regeneration is proving that it’s unfit for the job of remaking this part of our city, choosing instead to double-down on the failed strategies of the last few decades. I hope that the rumors are wrong, but can’t help but believe them. 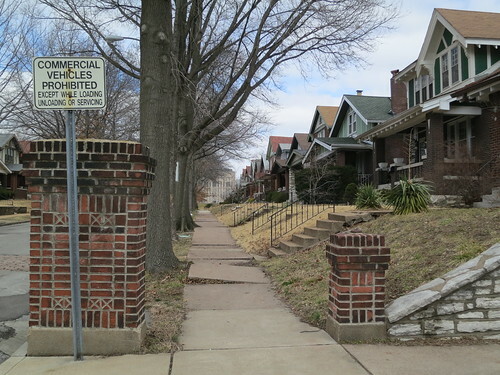 The Kings Oak Neighborhood has a small but beautiful residential section at its northeastern edge (Kingshighway and Oakland). The vast majority of the homes on these quiet tree-lined streets are occupied and well-maintained. This area has a lot of appeal, seemingly isolated but smack dab in the middle of the action. Unfortunately it’s shrinking. 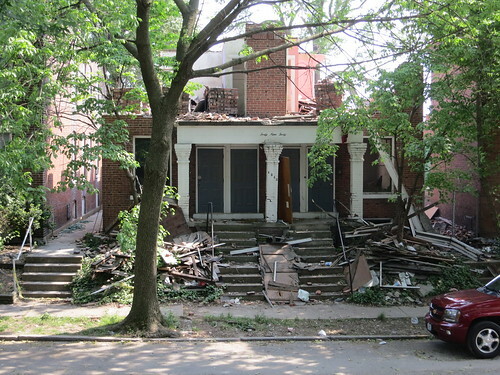 Despite their prime central corridor location, recent occupancy and sound condition, two four-family flats on Wise had to be demolished. In their defence, while a number of vacant lots already exist just across Kingshighway, it can be a terrifying street to cross on foot. 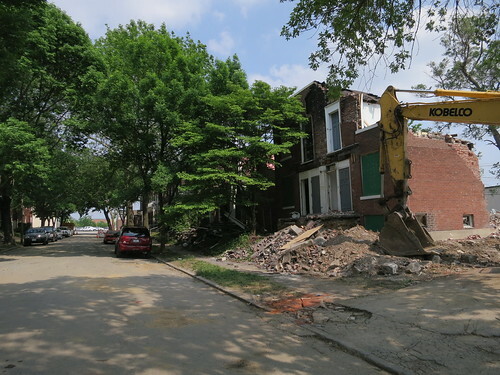 And what’s a St. Louis neighborhood without at least one vacant lot? Thanks SLU High!